In situ hybridization is a proven, powerful technique with applications in chromosome and genome analysis, as well as gene expression. Covering a carefully selected range of techniques with immediate and general applications in research and clinical diagnosis, the book starts with genome and DNA mapping, continues through gene expression localization in wholemount and tissue sections, and on to ultrastructural levels. The step-by-step protocols used reflect research in these areas and are all reproducible. 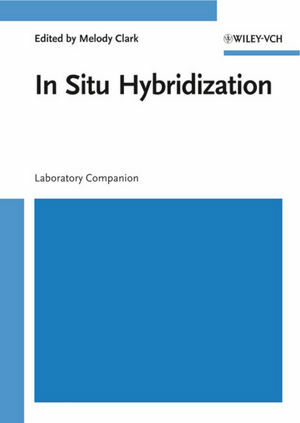 Melody Clark is the author of In Situ Hybridization: Laboratory Companion, published by Wiley. Chapter 1. Genomic In Situ Hybridization for Whole Chromosome and Genome Analysis (K. Anamthawat-Jósson, et al.). Chapter 2. Fluorescence In Situ Hybridization: Applications in Gene Mapping and Clinical Diagnostics (G. A. Evans and L. Selleri). Chapter 3. Detection of Nucleic Acids (DNA and RNA) In Situ by Single and Cyclic Primed In Situ Labelling (PRINS): Two Alternatives to Traditional In Situ Hybridization Methods (J. Hindkjær, et al.). Chapter 4. Fluorescence Immunophenotyping and Interphase Cytogenetics as a Tool for Investigation of Neoplasms (FICTION): Combined In Situ Hybridization and Fluorescence Immunophenotyping (K. Weber-Matthiesen). Chapter 5. In Situ Hybridization to Embryo Whole Mounts and Tissue Sections: mRNA Detection and Application to Developmental Studies (T. Jowett, et al.). Chapter 6. In Situ Hybridization at the Electron Microscopic Level (F. Wachtler, et al.). Appendix I: Labelling DNA Probes for In Situ Hybridization. Appendix II. Quantification of Efficiency of Incorporation of Labelled Nucleotides.